Getting to know your vehicle is the first step towards being a safe and successful off-road driver. There are various natural attributes of your vehicle which determine the severity of the obstacles you can drive. These include the approach, departure and ramp angles, the ground clearance and the suspension travel. These angles (shown in Diagram 1 below) dictate the severity of slopes your vehicle can attempt without damage. The ‘approach’ angle (a) is the angle formed if you draw an imaginary line from the bumper to the bottom of the tyre, and dictates the degree of slope which can be approached without contact with the ground. 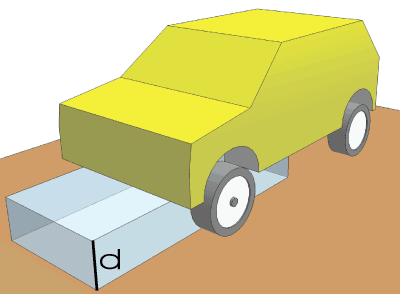 The ‘ramp’ or ‘ramp over’ (b) angle determines the size of a ramp-like obstacle which can be tackled. 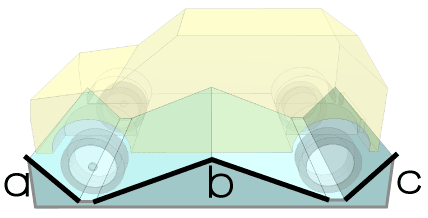 The departure angle (c) is the angle at the rear of the car. Various vehicle accessories can affect the angles – a good example is a tow bar, which tends to protrude into the natural departure angle. If the departure angle becomes less than the approach angle you might find the rear of the car touches the ground when climbing particularly steep inclines. Diagram 2 highlights this issue using an exaggerated pick up truck to illustrate the problem. Decent ground clearance is vital if you want to make progress without dragging the body of your car over the ground. Ground clearance is usually determined by measuring to the lowest point on the car which is usually the differentials (if your 4×4 has solid axles). Good suspension travel allows all four wheels to remain in contact with the ground for as long as possible – this increases traction and will allow you to progress further before getting stuck.